Over 25 years ago, Sprenger and the inventor Erwin Meroth developed the first jointed stirrups. The stirrup is characterised by a forward and backward moveable tread which automatically turns the rider’s heels in the correct low position and reduces the risk of becoming stuck in the stirrup in case of an emergency. The movable tread enables permanent contact and additionally provides very good foothold and relaxed calves. This might explain its great popularity among show jumpers and military riders. 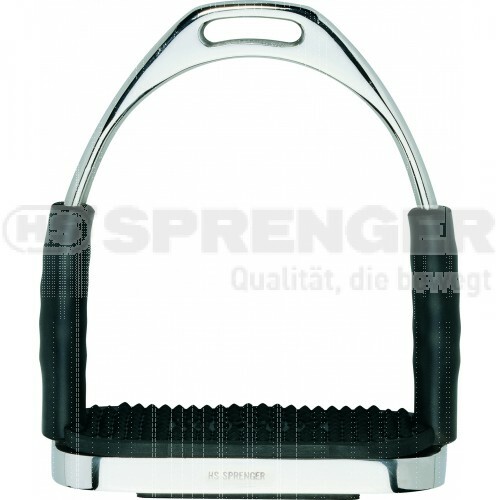 In 1998 Sprenger improved the stirrups flexibility by extending the joint with an additional link. The advanced stirrup distinguishes by maximum comfort in addition to the known advantages. It relieves hips, knees and ankles during riding and particularly spares ligaments and menisci. Until today this patented “System 4 jointed stirrup“ is an epitome for comfortable riding. It has unquestionable confidence and is used by both, leisure and professional riders.